About this gofund and why should you donate? Always being haunted with the feeling that I should be doing more after capturing someone's misery leads me to create this fundraising. While being on the field to report there's always a need for direct assistance. As photojournalists, we become involved by witnessing the injustices that unroll in front of our eyes. Photographing injustices may help to spread awareness, put pressure on political decisions and taking an action towards the overall humanitarian cause but most times it does not help to provide or assist direct basic human needs. This is usually the responsibly of organizations & volunteers. Although, in some cases there's always people who are forgotten about or unable to access proper assistance from organizations. This campaign is self-run and I will personnaly recieve all the donations. I will use each of your fundings to directly assist the needs of individuals and families that I meet during my photo trips who are in critical need of assistance. These needs can range from food, clothing, care products to even further elevated needs such as contribution towards hospital bills, education and anything else that may be required depending on each circumstances I encounter. The goal of 20000 euros is to have a on going campaign to not only be able to keep assisting during each social issues I will be covering in the future but to also keep assisiting individuals I am in touch with. There will be an update prior & each time part of the funds will be delivered towards a specific need for an individual, family or cause. Please check updates on top right next to story. NONE of these funds will be used to cover my own expenses for travel or photo related work. This fund is purely extra money to give to individuals and families that are victims of war & poverty under critical needs. What issues and causes am I covering? For the past two years I have been mainly focusing on the refugee and immgration crisis. I have documented the Calais Jungle for over a year, refugees stranded in Greece and visited asylum centers in Sweden. I have also been to Ukraine and followed a public organisation named BALTO which do their best to support all IDPs (victims of the current war) and are currently in critical need of economic support to keep providing care assistance. I´ve recently took a trip end of February 2017 to Africa, Gambia. The country is currently going through major democratic change with recent elected president Adam Barrow and the final step down of more than 20 years of dictatorship under Yahya Jammeh. I have documented the life of a young man Abdou Manjang & the poor community of Freetown who struggles to educate children in their village. Please check full story in update. How will the funds be released? Part of the funds are proportionally released every month and used on indiviudals I am in touch with who are in critical needs. 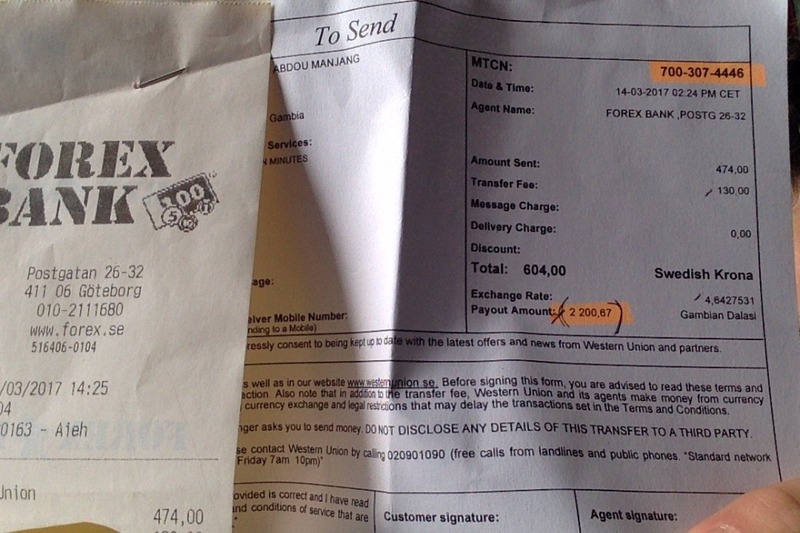 The transfers are done through service like transferwise & Small World to limit all fees. If on the spot the funds are used direclty to purchase what is needed at the time. Thank you for your donations and giving the opportunity to assist war and poverty victims around the world. here´s a new update on behind the photos. I recently came back from NY where I had a fundraising photo exhibition for Abdou which went better then expected. I was able to sell quite a few photographs and receive further donations to keep helping Abdou and his community. These recent funds don´t show on this current gofundme page but they will also be used towards Abdou and the school he teaches at. A follow up a trip is planned in November 2017 to take actions on the spot. I am also writing to you concerning a recent Syrian refugee case which requires further support. For almost tow years I have been following, a Syrian young man, Bassam who is also now a friend. 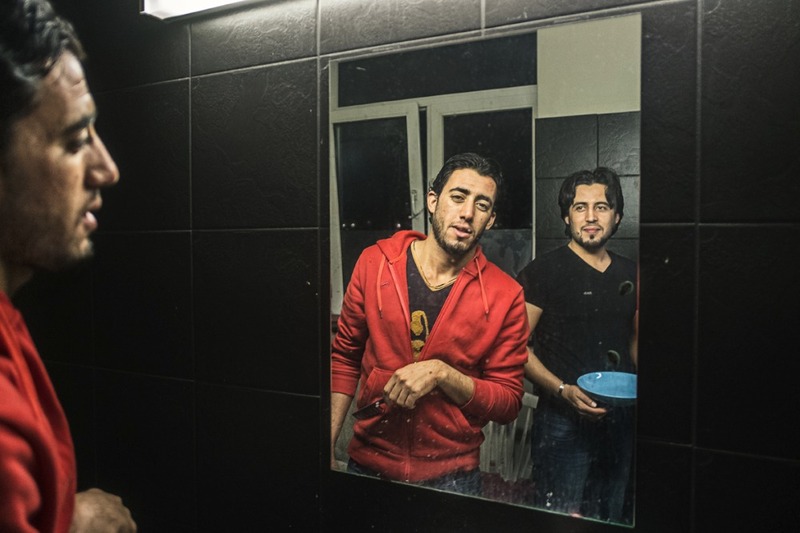 Bassam, first arrived to Sweden with his 3 other cousins to Sweden in September 2015 (prior to the borders closing.) 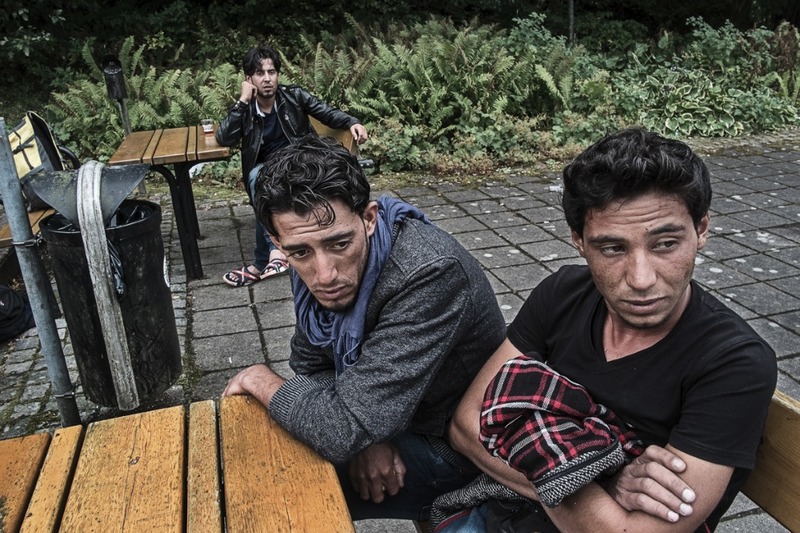 The 4 young men crossed Europe for two weeks and finally arrived on the ferry to Sweden from Germany. I was at the port photographing the arrival when they first arrived, I met them on the bus which took all arrivers to the immigration board to be registered outside the city of Göteborg. After being transferred in the middle of Sweden in Filipstad, the young men waited over a year to be finally granted asylum. Since the journey was too dangerous they decided to live their wives behind and planned to reunite with them one their residence would be approved. Unfortunately, almost two years later, the borders are closed and the Swedish rules also changed for family reunification. Now a family member has to apply on their own and are given a chhoice of countries outside Europe to be reunited at. One of those countries beside Turkey is Sudan. Bassam´s wife applied for reunion in Sudan through the Swedish Embassy in the capital city, Khartoum. Bassam´s wife has now crossed Syria from east to Damascus and is currently waiting to fly out of the country to Sudan. Bassam wants to be able to meet her once she arrives in Sudan to start the reunification process. Unfortunately he is on a low monthly income of Swedish refugee support while training to be a certified welder to get a full time contract work. He asked me if he could borrow money from me to cover his travel expenses and to be able to find an apartment for his wife once in Khartoum, Sudan while the reunification process takes place. I can not refuse as this is potentially a life and death situation. I promised to cover his plane ticket and expenses of stay once there. As this would take a big portion out of the money I already raised, even though Bassam promised to pay me back in the next few months, I do not want to put more pressure on him to do so. Any further towards Bassam and his wife would be greatly helpful. I am aware that a lot of you have already given and it is greatly appreciated and makes a difference in Abdou´s life, the women of Ukraine and other refugees I am in contact with. I was recently asked if what I do as an involved photographer makes a difference? and I can confidently answer that yes it does. Abdou can confirm that when he receives rice money every month and is able to feed is family. Thanks again to all of you for your regular support and following the current work. Hello everyone, another quick update to let you know that I have transferred money to Abdou for this month (April) to buy 2x 50kg bags of rice. Here are the photos below he sent me to show he received the money and purchased the two bags to feed him and his family. Also I will transfer some money to help out my friend Bassam from Syria. He has been in Sweden since September 2015 (before the European borders officially closed) and finally got his Swedish residence approved this past fall. Although, he left his wife behind in Syria since the journey was too dangerous. The original plan was to bring her to Sweden once Bassam would receive the residence but since the laws have changed for family reunions and the borders have closed, it is trickier to do so. She is currently in great danger as there is great chance they will start bombing over the area she is currently living in. Bassam has been trying to save money to get her out and buy her a plane ticket to make a possible official reunion in Sudan with the Swedish embassy there. I will forward 100 euros to Bassam towards a contribution to buy her a plane ticket. See it never stops, help is constantly needed. Please feel free to make a monthly pledge if you can afford it to further help and assist. We've just reached over 1000 euros! This is really cool. I never thought it would get this far. Thanks to all of you who have donated so far. So far I have been giving 2200 Dalasi (45 euros) money to Abdou and his family as I mentioned before to buy rice every month. 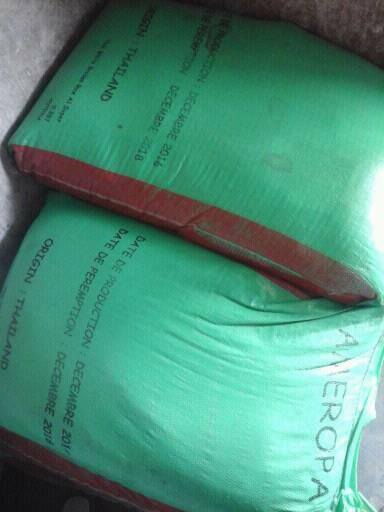 I bought them 2x50KG bags of rice for the cost of 2200 when I was there during my trip. 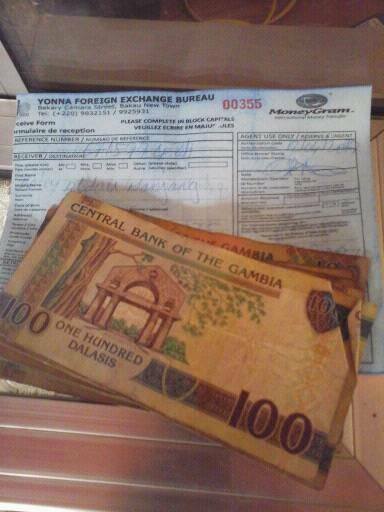 I forwarded Abdou 2200 Dalasi in cash to buy more rice for March. I will forward again the same amount of 2200 Dalasi to buy 2 bags of rice for the month of April. I am waiting for Abdou to confirm when they are running out to do the transfer. Because of your donation, Abdou was finally able to open a bank account and start to save money from his teacher's salary to eventually buy cement for his house, remember so his house stops falling apart every raining season. So trust me all your donations are actually turning his life situation around little by little. I also met with Amadou last week, the manager & founder of Freetown pre-school. He told me that what is needed to support the school is to raise the teachers salary as their salary is very low and barely covers their living expenses such as food. There are a total of of 5 teachers and Amadou would like to raise their salary to 500 dalasi (11 euros) each a month for a period of two years. This would mean to raise a total of 1320 euros so it's definitely doable. This is why I would need all of you to keep donating whenever possible. 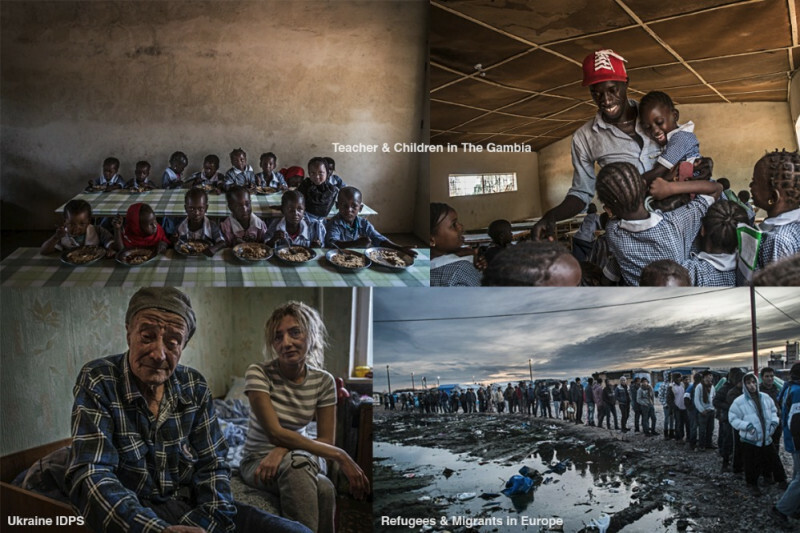 As this gofund is not only for Abdou and the pre-school in The Gambia but for all people I have met and meet during my photo trips, I have also sent money to Ukraine to help warm victims (IDPS) close to the conflict zone. I sent Anfisa 36 years old single mother of her 13 years old daughter Amira and takes care of her 70 years old mother Svitlana. The family of three women are living on low economical support from the Ukrainian government, Anfisa spends her days helping the local IDP organization as well as searching various IDP plans or sponsors to provide her daughter and mother's needs. 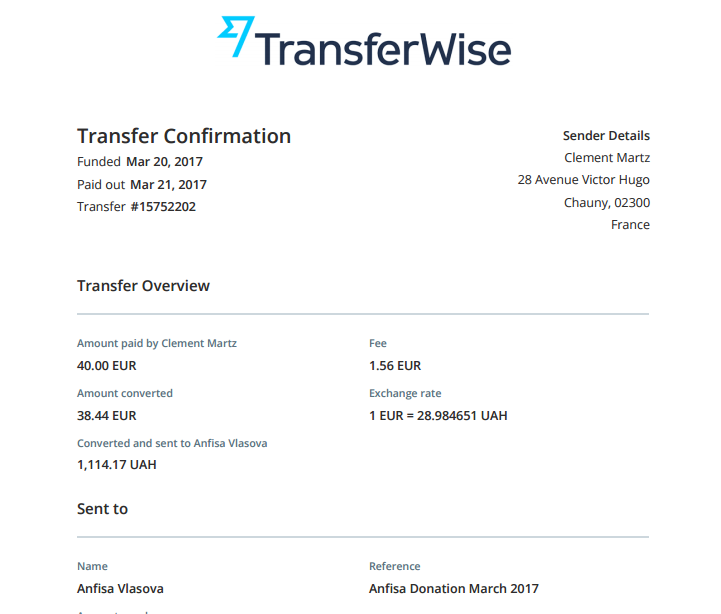 I sent them 1114 hryvnia for the month of March (40 euros) which is more than the IDP support of 800 hryvnia from the Ukranian government. I have also sent money to Balto the organization that Anfisa volunteers at. Balto is responsible to provide support for IDPS by linking a bridge between international organizations and to inform them of their right. Unfortunately the Ukrainian government stoped covering their rent cost for their office and they had to move out. They relocated their office into a smaller building but now Balto also needs to find sponsors to cover their rent cost of 2500 hryvnia (90 euros) monthly. I have also sent them donations to cover their rent cost for April. 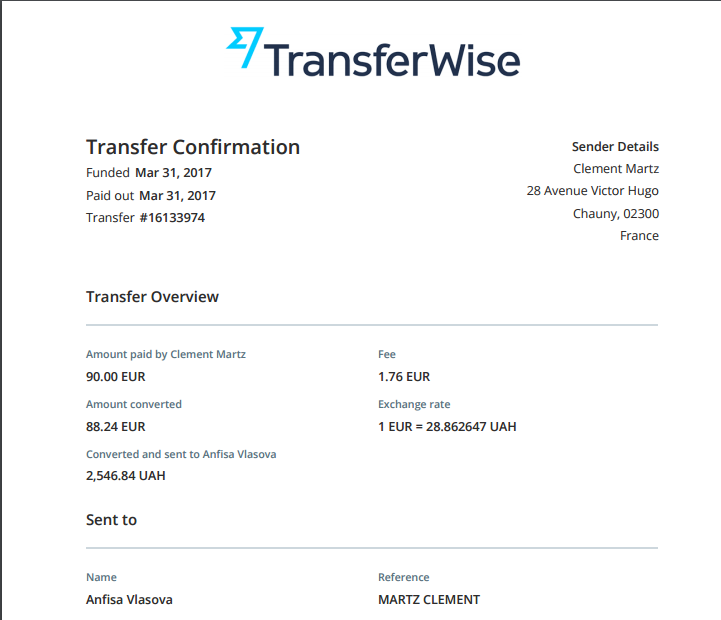 So far I have spent a total of 260 euros from your donations so far, including the rice cost I will forward to Abdou next week. Please find all proofs of money transfers below. So see how much can be done with such money! Let's try to keep going as these people need our support. Thanks again for all your donations, it would not be possible without people like you. I'd like to have a job like yours, but I can't, so I help by donating. Sorry for the low value, my currency is not worth so much. Congratulations on your beautiful work.